Wind chimes are widely regarded not only for their soothing sound but also because they are visually pleasing. And if you plan on buying them in a store, you'll find them rather pricey, too. However, they don't have to be expensive. 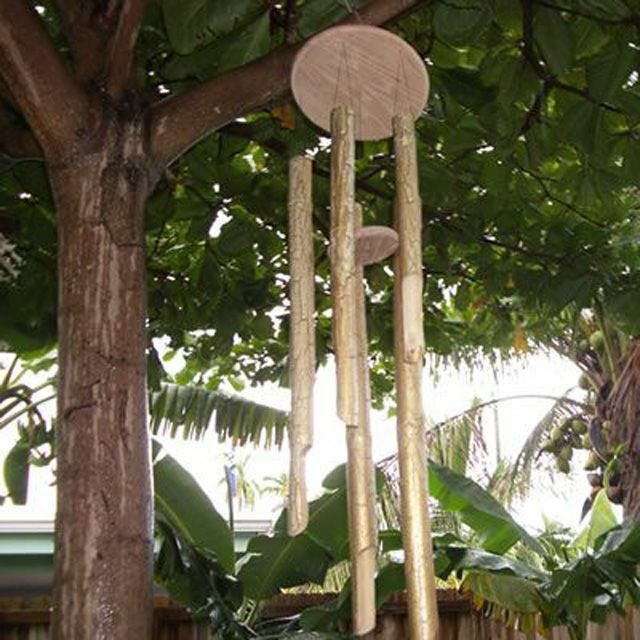 In this set of free woodworking plans, we walk you through building a bamboo wind chime. This is a surprisingly easy woodworking project, one that you can build with your kids. Matter of fact, a number of the pictures you'll see in the upcoming pages will be of my twelve-year-old son, C.J., working with me to build our prototype. There are some tasks on some power tools that you'll likely want to perform, but a number of other tasks are safe enough that kids can handle them easily. It is a good opportunity to teach your children proper respect and use of your woodworking tools, and you'll have a very nice addition to your back yard to show for it. To begin this project, we'll need to cut two circle-shaped pieces of hardwood. The best method we've found for cutting these circular shapes is to use a circle cutting jig for your band saw, which we showed you how to build in a previous woodworking project. If you are preparing to build these chimes and haven't built a circle cutting jig yet, don't worry; it's a quick, simple project. Cut a piece of hardwood to 11-1/2" x 11-1/2". With a straight edge, draw a line from one corner to the opposite corner, then draw another straight line between the other two corners. The intersection point should be dead center on the piece. Set up your jig and place one 4d finish nail as a pin at 5-3/4" on the center line from the band saw blade. Then, using the same drill bit you used to place the pin in the jig, drill a very small through-hole to accommodate the pin in the center of the piece of hardwood. Align the hole in the hardwood on the pin and tap the wood onto the pin until the piece is flat on the jig's table. Then, start up the band saw and carefully cut out the circular shape, rotating the hardwood around the center point. As you can see in the picture above, this is a task that C.J. was easily able to handle (with some close supervision). Cut another circular shape with a 5-1/2" diameter from the remaining hardwood. With the remaining hardwood scrap, cut a trapezoid (or similar shape) for a wind catcher. A piece about 4" tall, measuring 4" across at the top and 6" across at the bottom would be ideal. Drill a small hole about 1/2" down from the top-center of the wind catcher. With the three pieces of hardwood cut, sand the sides and edges of the three pieces so that they are as smooth as possible. Pay special attention to the rounded edges of the two circular pieces. Smooth out any possible rough spots, as they'll cause a bit of a problem with the next step. With the three hardwood pieces sanded thoroughly, we'll turn our attention to rounding over the edges of the three pieces of hardwood. Set up a router in your router table with a 3/8" radius round over bit equipped with a bearing tip. As we'll be rounding one-half of each board at a time, adjust the depth of cut so that the bottom of the cutting head is just beneath table level. Check the cut with a piece of scrap stock. When the depth is adjusted properly, route one edge of one of the circular pieces. Hold the piece securely against the table, and with the wood firmly against the bearing, smoothly route the stock in a semi-circular manner until the entire circle has been traversed. Then, flip the stock over and round over the opposite side. Repeat the procedure with the other circle, then with the wind catcher. After rounding over both sides of the three pieces, sand the rounded edges by hand with progressively finer grits of sandpaper until all three pieces are smooth. With the work on the hardwood complete, we'll turn our attention to the bamboo tubes. Take a look at your two 6'-long bamboo tubes. One should be naturally thicker than the other one. For this particular wind chime, we chose to make five tubes that were each five inches shorter than the next. In retrospect, for the next wind chime, we'll make the distance between the tubes much less, for two reasons. First, cutting the tubes only two inches shorter than the next tube will keep the tones relatively close, making for more melodic sounds. The second reason to have the pieces relatively close in size is to help keep the top circle shape more level when the piece is hung. In our prototype, the longest piece is 34" long and the shortest is 14", which means much more weight will be on one side of the chime than the opposite side. However, the beauty of this project is that you can modify it to any size you feel will be appropriate. With that in mind, we'd recommend cutting two lengths of bamboo from the larger piece, one at 30" and another at 28". This procedure can be accomplished with a miter saw, but we found there was less splintering if we cut the pieces with a crosscut hand saw. Cut the smaller piece of bamboo into three pieces, 26", 24" and 22". Next, we'll cut the fluted bottom edges of the five pieces. You can cut almost any shape you'd like, but we thought the shape as shown in the picture above was appealing. To cut this shape, mark a straight 5" line up from the bottom of the tube. From the top of the straight line, angle your pencil mark up to the edge of the bamboo (at about a 45-degree angle). Then, match this same angle from the bottom edge of the bamboo piece to the center line. The pencil line should approximate the profile shown in the picture above. With the profile of the fluted ends marked with a pencil, we'll now cut out the ends on a band saw. You'll be free-handing these cuts on your band saw, but fortunately, the bamboo cuts easily and cleanly if you take your time. Be careful not to rush, particularly when ripping with the grain (up the stalk), as dried bamboo has a tendency to split. Place the bamboo on your band saw with the center line on the very top. You'll want to avoid twisting the piece as you cut it to keep the back side of the profile even with the front side. Begin cutting at the bottom corner mark and work your way into the piece of bamboo. When you get close to the center line, ease the bamboo until it is parallel with the blade, again taking care keep the pencil line at the very top of the piece. Continue upwards until you get close to the opposite angle mark, then ease the bamboo around until you are at the proper angle, and finish the cut. Repeat these steps with the other pieces of bamboo. Sand each flute by hand. The next step in this woodworking project is simple, but a bit tricky. You'll notice there are nodes about every twelve to sixteen inches along the length of the bamboo pieces. The area inside the tubes is hollow in between these nodes but enclosed at the node. To achieve sound, we'll need to hollow out the nodes. The best way I've found to do this is with a 1" paddle bit and a 12" extension, available at any home center. Use the paddle bit without the extension for every node that is less than six inches from the end of the tube. Simply hold the bamboo securely and drill out the node. When needing to cut deeper nodes, use the extension. Try to center the bit as best you can on deep nodes. Tip: Paddle bits can grab and twist stock right out of your hand, so hold the bamboo securely on your work table and drill slowly. If the bit grabs, stop, secure the bamboo again and proceed slowly. The nodes will drill out very easily in only a few seconds each. With the bamboo cut and the nodes drilled, the next step in our bamboo wind chime plans is to cut the holes in the top circle for the tube strings. In this step, we're assuming an 11-1/2" diameter hardwood circle and five tubes. If you decided to use a different diameter circle at the top or more (or less) tubes, you'll need to adjust the math in this step accordingly. With a straight edge, mark a straight line from the center hole on the large hardwood circle to the edge. Next, grab your compass and widen it to a 5" radius. With the width exactly 5", place the point in the center hole and scribe a 5" radius circle all the way around the piece. Now, with your tape measure, begin where the straight line meets the circle, and measure 5-7/8" to one side, finding the point where this distance meets the circle. Make a mark at that point, intersecting the circle. Continue around the circle, making marks every 5-7/8" (on the circle). When you've completed the fifth mark, verify that the distance from mark 5 back to mark 1 is 5-7/8". If so, you successfully scribed the five equidistant points on the circle (72-degrees from the center for each line). Next, measure the diameter of each piece of bamboo tube at the top. You'll be ordering the bamboo sequentially around the chime from longest piece to shortest. Divide the diameter of the longest piece in half. Mark this distance on either side of the first mark on the circle. Where these two marks meet the circle will be the points to drill through holes for the strings of the longest tube. Repeat this step with the other four tubes. After the holes are drilled, this would be the ideal time to apply finish to the three pieces of hardwood. You may paint the pieces, or use stain and polyurethane, whichever you choose. The last woodworking step of this project will be to drill holes near the top of the tubes for the tube strings. While matching the rip cut on the bottom of the tube, measure down one inch from the top of the tubes and place a mark. One mark should be placed on each side of the top of each tube. With the locations marked, drill a small hole (about 1/8" diameter) at each location. Because bamboo tends to splinter, drill from the outside in on each hole rather than drilling two holes at the same time. If your bamboo is particularly dry, you may wish to wrap the top with masking tape before drilling to minimize splintering. The begin the last step of these free woodworking plans, cut five pieces of 30-pound monofilament fishing line at 24". Snake one line through the two holes of each of the tubes. Then with the largest tube aligned with the circular base, feed each end of the line through the appropriate holes. Pull the line until the base is firmly against the bottom of the hardwood base, and even out the two ends of the string. Tie the two ends together four inches up from the top of the base with a double square knot. Trim the loose ends and secure the knot with a drop of super glue. Repeat with the other four tubes. Next, cut an 84" long piece of monofilament line. Tie one end to the metal O-ring. Next, feed the other end of the line through one of the ten holes around the perimeter of the chime until the O-ring is about six inches above the base. Working clockwise, feed the line back up through the next hole, through the O-ring and back down through the third hole. Continue feeding the lineup and down around the perimeter of the base, through the O-ring on every up-feed. After the tenth hole, tie the string to the O-ring after making sure that all ten lines to the base are even and the O-ring centered above the base. Once again, place a drop of super glue on the knot to hold it permanently. Next, cut a 60" long piece of line and tie it to the O-ring (be sure to glue the knot). Feed this section down through the center hole of the base. Next, feed this line through the center hole in the striker and tie a washer to the line at the height where you'd like the striker to stay. Finally, tie the bottom end of the line through the hole in the wind catcher, glue the knot and cut off any extra line. Your new bamboo wind chime is ready to hang and enjoy!